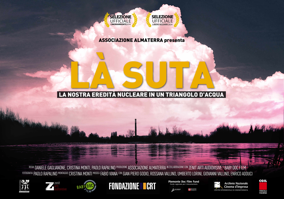 Synopsis: Saluggia, a small rural village 40 km from Turin, is where the majority of waste generated by Italian nuclear power stations is stored. In an area close to the banks of the river Dora Baltea, among the main tributaries of the Po, it is bordered by irrigation channels that carry water to the rice fields of Vercelli, and crossed by the aquifer that feeds the Monferrato aqueduct. This triangle of water, beginning in the 1950s, has seen the construction of a nuclear research centre, an experimental reactor and a reprocessing plant in which techniques have been developed, for both civil and military applications, for extracting uranium and plutonium from irradiated fuel elements. Spent fuel rods then arrived in Saluggia from Italian nuclear power stations and reactors from other countries in order to be melted and reprocessed in the Eurex plant. Still today liquid radioactive residues resulting from such treatment, the most dangerous of all nuclear waste, can be found there. In 2000 extreme flooding caused the Dora Baltea to overflow and the banks of the Farini canal to burst, inundating the nuclear sites with water. On that occasion, the Nobel Prize Winner for Physics Carlo Rubbia spoke of a “global disaster” being narrowly avoided. If any vats containing highly radioactive liquid waste had been dragged into the Po. While the creation of a single National Deposit where Italian radioactive waste can be safely and permanently stored continues to be put off, in Saluggia, on the same floodplain, a new temporary waste deposit called the D2 is currently under construction.